Four weeks until the Daytona 500 and the TSB gang is ready to strap in for another great season of NASCAR racing. However, before the green flag drops, the gang has to preview the teams of the NASCAR Sprint Cup Series. The first team TSB will be previewing is Penske Racing, winners of the 2012 NASCAR Sprint Cup Series championship. When Penske won the championship, under the helm of Brad Keselowski, they were operating Dodge’s. When the season starts at Daytona, the team will be powering under the Ford logo. With the change from Dodge to Ford, the team will no longer build its own engines. Instead, the team will get them from Roush-Fenway Racing with the two owners pledging to work closely with each other and share information. Another change at Penske Racing is the driver of the No. 22. After a few rocky driver choices, Penske hopes Joey Logano will be a shining light for the team. Logano will be working with Todd Gordon, who will be returning as the crew chief for the No. 22 Shell/Pennzoil team. 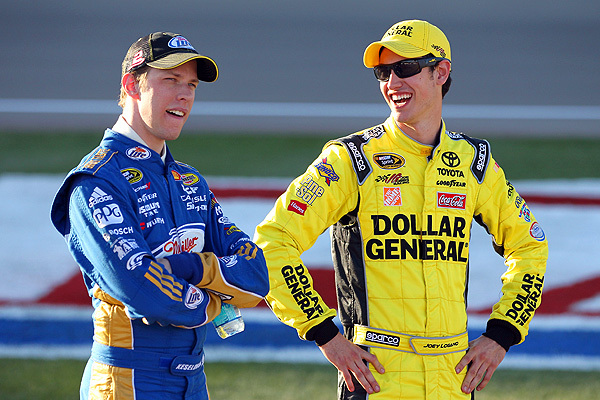 Did you know that Keselowski himself played a major role in the recruiting of Logano over to Penske? The two have really hit it off during the winter’s test sessions. If Keselowski gets use to the Ford horsepower quickly, I expect him to make a charge for a second NASCAR Sprint Cup Series championship, as for Logano, I don’t expect much from him this year but hopefully he is more consistent than he was at Joe Gibbs Racing. To talk more NASCAR, follow me on Twitter @NASCARKrissy and stay tuned to Total Sports Blog as we preview another team tomorrow.